The three ridges, as labelled are the Alpha Ridge, Lomonosov Ridge and the Gakkel Ridge, the latter being the slow moving plate boundary between the Eurasian and North American plates as an extension of the Mid Atlantic Rift, according to the Polar Discovery page Arctic Seafloor Expedition: July 1-Aug. 10, 2007. What is the tectonic explanation for these parallel ridges in the Arctic Ocean? Additionally, are they in anyway linked? The fact that these three features are parallel may be somewhat coincidental, although we can suspect that tectonic forces have influenced their morphology. 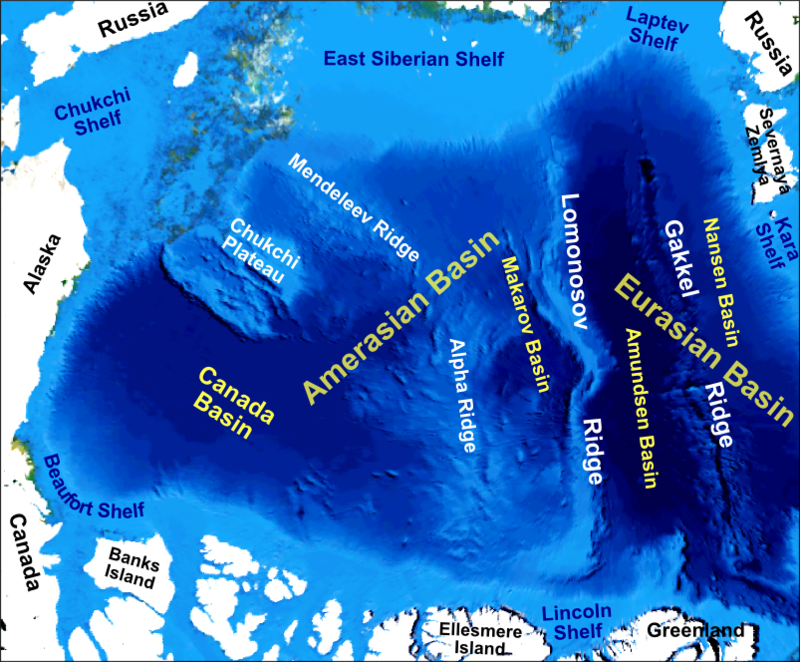 The crust under the Arctic Sea is one of the least understood regimes in the world. This is changing - whichever country can prove that their nation's continental shelf extends along one or more of these ridges can, according to the United Nations, claim subsurface oil and minerals. Candidate countries include Russia, Canada, Norway, the USA, and Greenland/Denmark. As a result, there has been recent seismic and geological work in the area, though some of the reports are nuanced in an effort to bolster nationalistic claims. Alpha Ridge is a volcanic ridge extension off the continent from Ellesmere Island, Canada. Lomonosov Ridge seems to be ancient continental crust and is likely an extension of Canada's continental shelf. Gakkel Ridge accompanies a spreading seafloor rift which extends north from the mid-Atlantic ridge. It has the slowest divergence of any mid-ocean ridge in the world (less than a centimeter a year). There are two basins in the Arctic. The part closest to Europe, the Eurasian Basin, formed when the mid-Atlantic Ridge grew to the north, becoming the Gakkel Ridge. It divided a long, narrow strip of continental crust from the Barents Shelf, the Lomonosov Ridge. This action resulted in Lomonosov's parallel orientation to the Gakkel. Since the Alpha Ridge is further to the west and within the Amerasian Basin, it might be a stretch to suggest it is related to the Gakkel. It's parallel orientation is more likely an accident and in time it may rotate with respect to the other two ridges. For an accessible and lucid description of the Arctic's tectonics, this piece by Bernard Coakley in the New York Times is quite good: http://scientistatwork.blogs.nytimes.com/2011/09/15/northern-lights-on-the-midnight-watch.